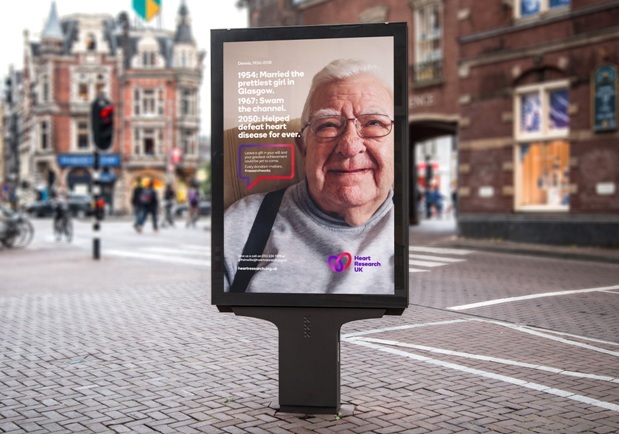 Yorkshire branding agency, 10 Associates, teamed up with a local worthy cause to produce a thought-provoking campaign aimed at raising awareness about heart disease and leaving a gift to help charities continue to fund pioneering medical research. 10 Associates, from Mirfield, teamed up with Leeds-based Heart Research UK to roll out a legacy campaign entitled ‘Your greatest achievement is yet to come’ – celebrating great, human interest stories by picking out impressive milestones they had achieved throughout their lives and how helping a worthy cause in their Will could be their proudest moment yet. The gripping campaign was in response to national statistics reporting that nearly £10 billion was donated by the British public in 2017, with legacy income accounting for £2.8bn, yet it was found that only six per cent of people leave a gift to charity in their Will. Bringing together relatable and creative elements as part of the impactful campaign, 10 Associates helped to paint a picture of a person’s life, highlighted some of their landmarks and proudest achievements and how they should be fondly remembered through giving a legacy gift to a worthy cause to continue to help others. The first campaign image shows Dennis, born in 1936, who married the “prettiest girl in Glasgow” in 1954, “swam the Channel” in 1967 and in 2050 “helped defeat heart disease forever”. The advertising campaign will be seen across various publications and media throughout next year. Katy Gray, head of brand at Heart Research UK, said: “We really wanted to highlight a great act that people can be proud of and encourage people, especially during their Will writing, to consider how they can really help others once they are gone.